●Connect to iPhone/iPad/iPod Touch data port directly. No need app installation. ●It supports a Lightning cable to charge iPhone/iPad/iPod Touch. ★The lightning 4 in 1 Camera Connection Kit has 4 ports. However, USB port, SD port and Micro SD port can't be used at the same time. The Lightning port can be used together with any of above 3 ports. For example, you can charge iPhone/iPad/iPod Touch and put keyboard type at the same time. ★If USB flash disk/ Micro SD card / SD card directly use with this kit, you must create "DCIM-folder. The device that be connected to USB Receptacle must be less than 100 mA. You can connect USB peripherals like Hubs, Keyboard and card reader for Compact Flash, SD, micro-SD, and more. 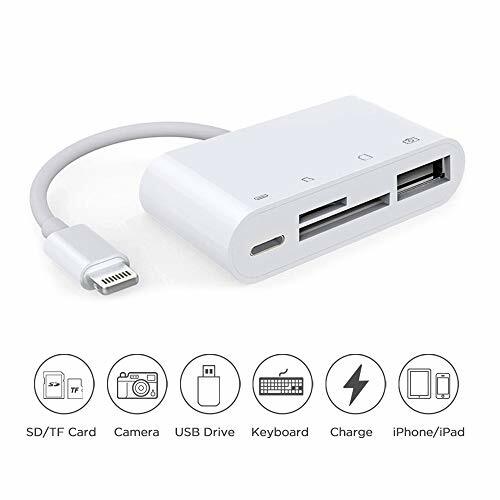 You also can plug the connection into the dock connector port on your iPhone/iPad/iPod Touch, and then attach your digital camera USB cable. Furthermore, the USB port supports external PC. ♥ Moreover, New Function - It allows you to charge iPhone/iPad /iPod Touch.via a Lightning cable, .It is "One-Way-Transfer"
If you have any questions about this product by XMGBJYTQ, contact us by completing and submitting the form below. If you are looking for a specif part number, please include it with your message.